LIC Jeevan Anand 149 – Features, Benefits and Maturity Calculator. 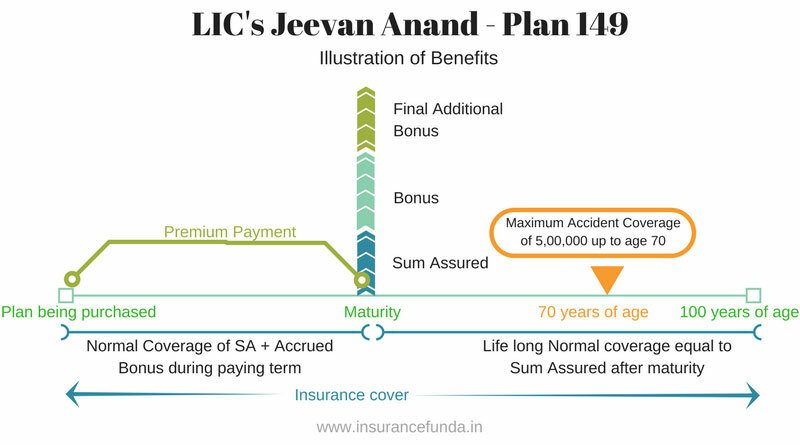 Jeevan Anand (Plan 149) is by far one of the most popular insurance plan from the one and only public sector insurer – Life Insurance Corporation of India. This plan has already been withdrawn from sales and is not available for purchase. LIC has introduced another similar plan as the successor of Jeevan Anand (149) plan with the name New Jeevan Anand and bears the plan number 815. Final Additional Bonus – one-time bonus paid on exit by maturity or death. LIC Jeevan Anand 149 – Example of Benefits. Jeevan Anand plan is a combination of an Endowment Assurance plan and a Whole Life plan. Insurance Coverage equal to the Sum Assured shall continue even after the maturity and shall be available for lifetime or 100 years of age whichever is earlier. Double accident benefit and extended permanent disability is available as an inbuilt benefit under this plan and shall be available during the term of the plan and also till the age up to 70 years. Maximum DAB & EPDB cover will be Rs. 5 lakhs. Maturity benefit of the plan will be payable after the completion of the premium paying term. You should not confuse between the term and premium paying term. The term of the plan is the period up to 100 years of age. Whereas the premium paying term is the period chosen by the policyholder (between 5 to 57 years). The maturity benefit shall be the total of the Sum Assured, Accrued bonus and the Final Additional Bonus (as per the declared amount at the year of maturity). The plan will have two types of bonuses. One is the simple reversionary bonus which is declared every year and is added to the policy account as and when it is declared. And the second one is Final Additional Bonus which is a one-time payment available at the time of exit from the policy by way of maturity or death. Latest Simple reversionary bonus rates for the plan (per 1000 sum assured) is provided in the table below. Final Additional Bonus rates applicable for Jeevan Anand plan is as follows. In case of maturity, the term of the policy is considered and on the other hand, in case of death cases, period till death is considered. Read more : Bonus rates declared by LIC for the year 2018-19. Premium, Benefit and Maturity calculator for LIC Jeevan Anand (Plan 149) is an online calculator to understand all the benefits of the plan in an easy manner. This calculator can provide you all the details such as, what you are paying, the pattern of insurance coverage, maturity benefits, etc. You can supply your own details such as Age, Sum Assured, Term, etc and get complete details of the plan in a table format. If you are unable to view the premium and benefit calculator for Jeevan Anand Plan here, click to open Jeevan Anand -149 – Premium, Benefit and Maturity Calculator. Jeevan Anand 149 offers two types of death coverage. Death coverage after the premium paying term: Jeevan Anand plan provided special additional risk coverage equal to the sum assured of the plan even after the premium paying term. In order to understand the benefits of Jeevan Anand Plan let us consider an example. Let us assume that a 30 year old person is taking a 10,00,000 policy with term 25 years. The benefits as per the current bonus rates shall be as given below. Yearly premium required is Rs.41,206 and the premium has to be paid for 25 years. Total premium paid is Rs. 10,30,150. The maturity benefit* of the plan as per the current bonus rate is Rs. 26,35,000. Additional whole life coverage of Rs.10,00,000 also shall be available. So the total benefit payable form LIC shall be to the tune of Rs.36,35,000, including the whole life coverage. The benefits shown above are as per the parameters mentioned above. If you want to get the benefit illustration based on your own details, please use the online calculator. Disclaimer* The illustrations shown above are as per the current bonus rates of the plan. The amount shown is not guaranteed and the actual returns shown can vary based on the actual experiences of the corporation. The best method to find out the interest rate offered by an insurance plan is to calculate the Internal Rate of Returns(IRR) it offers. Jeevan Anand is an insurance product and hence naturally there will be loading for providing the insurance benefits. If you want to compare this plan with other savings plans you should remove this loading and then find out the rate of return it offers. Death at the age of 80 Years. Let us apply these scenarios for the example considered above. So the Internal Rate of Returns(IRR) offered for the plan can vary from 7.09% to 10.45% in the considered scenarios. Jeevan Anand plan as other endowment type of plans follow E-E-E (Exempt-Exempt-Exempt) patern as far as income tax is concerned. Premium Paid is exempted from income tax as sec 80C of income tax act. Maturity amount is income tax-free u/s 10(10D) of income tax act. This plan can be surrendered during the premium paying term or even after the maturiy. Let us have a detailed look. Jeevan Anand plan can be surrendered for a reduced cash value any time after it has acquired paid up value. Inorder to acquire paid up value , Three year has to be completed from date of commencement and 3 full year premium has to be paid. For all policies where premium has not been paid for at least three years, nothing will become payable. While calculating the surrender value of any endowment type plan, following are the formulas that become applicable. If you are thinking of surrendering the plan,my advise is to consider following point before taking a decision. Jeevan Anand provides free life long insurance coverage even after receiving the maturity amount. Even though it is not advisable to forego the life long insurance coverage, LIC provides a facility to surrender the coverage and obtain the cash value of it. The amount available on surrender can be calculated from the chart provided above. Surrender value per one lakh sum assured policy is provided in the chart. LIC’s New Jeevan Anand (Plan 815) all details, benefits and calculators. Can i change the nominee? Sure You can change your nominee any time. Please approach your nearest branch office to do nomination change. Hi Anish, Sorry that I’am posting my query on one of your replies. I could not find the other way to do it. I have a Jeevan Anand – 149 policy. Bought in 2013 Jan. I have paid premium for 6 yrs totally. I want to surrender this policy now as i do not wish to continue with it. What will be the returns i will get on surrendering it. SA is 700000 & yearly premium is 35895. Table & Prem paying term as mentioned on policy is 149 / 71 / 21. I’m unable to get clarity from the agent who sold me this policy. Please advise. Premium paying term is 21 years and you have an insurance coverage up to age 100 which is 71 Years from date of commencement. That is what mentioned. Hi Sir, For Jeevan Anand 149 Policy, the Policy Term is 71 Yrs and Premium Paying Term is 16 Yrs. Can I surrender the policy after 16 yrs ? Will I get full amount or only partial ? You will get ‘Maturity amount’ on the sixteenth year, which includes Sum Assured + Bonus + Final addition bonus. If you surrender the policy on 16th year you will lose the ‘life long insurance coverage’. You will get Maturity Benefit after the premium paying term. Maturity amount includes Sum Assured + Bonus + Final Additional Bonus. Life long cover continues even after premium paying term. here the maturity date mentioned is 2072, but paying term is 12 years. So, when i will get the benefits or final settlement. Insurer is healthy. In Jeevan Anand Plan, Maturity amount which includes Sum Assured, Accrued bonus and final additional bonus(if any) shall be available after premium paying term. Life long coverage continues till 100 years of age. That is the reason why maturity is given as 2072. You can surrender the insurance coverage available after the maturity in Jeevan Anand plan. Please refer to this chart. Hello – I have Jeevan Anand 149 Policy. There is an endorsement that states “Double Accident benefit and extended disability benefit under this policy is restricted to Rs. NIL only. What does this mean? Double accident benefit and extended permanent disability is available as an inbuilt benefit under this plan and shall be available during the term of the plan and also till age up to 70 years. Maximum DAB & EPDB cover will be Rs. 5 lakhs. So no such endorsement is possible in this plan. Please clarify with your nearest LIC branch office. i could have worded incorrectly. It is not an endorsement. Those words that i had mentioned was stamped and the word “NIL” has been hand-written. This is my SECOND jeevan anand policy. The branch office said that for Jeevan Anand the maximum DAB is 5 lakhs only. But that is not mentioned in the schedule…i mean there is no statement mentioning like irrespective of the number of Jeevan Anand Policies taken, the max DAB is 5 lakhs. Any thoughts here? Yes, what you said is right. Maximum DAB allowed under Jeevan Anand policy is 5 Lakh and if you have already covered that 5 lakh in your first policy itself, then no DAB shall be available in your second policy. That is the reason why DAB is given as NIL in your second policy. But, no where in the schedule i see a statement like “irrespective of the number of Jeevan Anand Policies taken, the max DAB is 5 lakhs”. Is this been mentioned somewhere, that i am overlooking? I asked the agent for 50Lakhs sum assured policy. He gave it to me in 26 differnet policies with different paying terms for each. He also told that I don’t have to pay any premiums after 17 years even though the payment terms in all but one policy is more than that. I don’t understand why that was done so. Any advice? I think the agent has given a series of policies maturing every year from the 17 th year. There are some advantages as well as disadvantages while splitting policies in this manner. One advantage is that as each policy mature every year it will work as a pension plan and there will not be any tax burden on the pension received in this manner as the maturity amount of the policy is tax exempted under section 10(10D). On the other hand if you take a regular pension plan, the pension received will be taxable and will be added to your income. You may loose higher Sum Assured rebate if each of the policies are splitted into small policies. You will have to pay premium for entire period but the agent may be presuming that the premium can be paid from the maturity amount paid every year. Agent should have communicated clearly about the implications of giving multiple policies. Sir, Please tell me, when i will get the maturity money? Sir, Please tell me, when i will get the maturity money and how much? Maturity amount shall be available on completion of 21 Years (on 2034). Please use this calculator to get the expected maturity amount. Dear sir, what is the procedure for availing accident benefits under this plan in case of hospitalization ? Accident coverage available under the plan is for accidental death and permanent disability (which is irreversible) only. No hospitalisation benefit shall be available under accident benefit. is it possible to change the premium paying term and what is the process?. You can change the term subject to certain conditions. You can reduce the term of the policy but cannot increase it. As all policies do not allow term change please give the plan details for further information. Want to buy 5 years policy.Age is 46.Please give me best policies. LIC do not have any 5 Year policy. The only plan with the 5-year term is Jeevan Nidhi (Single premium)plan from LIC of India. I am paying a yearly premium of 49,872 and the number of terms is 21 and Sum Assured is 10,00,000. Using the premium calculator, the maturity benefit showed a value of 21,29,000 (SA 10,00,000 Bonus 1029000 & FAB 1,00,000). So does this mean I will be receiving an amount of 21,29,000 after completion of the 21 terms with additional life long coverage of 10,00,000? Exactly. This is the indicative maturity amount as per the current bonus rates and you will have a life long coverage of 10 lakh. The maturity date of your policy is 07/07/2023 and you will get 10 lakh + accrued bonus at that time. Please use calculator provided to get indicative amount. what amount is recoverable after premium payment term in jeevan anand plan -149? whether the amount recoverable is maturity amount or less? and when this amount could be recovered? After premium payment term, Jeevan Anand matures and Sum Assured + bonus + final addition bonus shall become payable. Life long coverage equal to Sum Assured shall be available there after. Hello Sir, Thank for the clear information about the maturity and still my confusion remain about the final settlement, try to get the information form many of LIC officers and they have no clear information. As you clearly illustrate that Return amount from LIC will be 36,35,000 /-, please clarify that physically i will get 36.35 Lack or 25.35 Lack only. because 10 Lack is belongs to life time insurance coverage of 10 lack, if i wish to cancel that coverage, should i eligible to get the 36.35 Lack ? Referring to above my question, i have been informed from agent that i shall get almost 50 lacks during my maturity period ( My policy is 20 Lacks for 16 year, as per your calculation ill eligible to get around 34.5 lack+ 20 lack life time coverage. This is the calculation based on current bonus rates. Maturity benefit includes 20 lakh sum assured + Accrued bonus + FAB ( approx 34.5 lakh) and life long coverage of 20 lakh. So total benefit is likely to the tune of 54.5 lakhs. Hi, I have a Jeevan Anand(Plan-149) of sum assured 3 lakhs which will mature in 2034. Expected amount I will get on maturity? as well what does it means as a life coverage, I mean post maturity I believe I won’t get any more amount in future? or is it post maturity only death benefit will be there which will be same as sum assured and which will be given to my nominee. Please use the calculator provided in the post to get the indicative maturity amount. At the time of maturity you shall receive Sum Assured + Bonus + Final Additional Bonus as a one time payment. Life long coverage means your nominee is entitled to receive on more sum assured as death benefit even after maturity. Only death benefit is payable after maturity. Thanks a lot. Its clear to me and the calculator is helpful too. Is there any such plans available in todays date. Also could you please suggest any good policy for children of age 9 years? Thank you for nice words of appreciation… A similar New Jeevan Anand plan (Plan 815) is available for sale from LIC of India. Read all you need to know about New jeevan Anand Plan 815 from this link. Please read the article New Jeevan Anand – a critical review also for more information. Please check Jeevan Tarun and Childeren Money back for your child. 1. Vested bonus + sum assured only we get after maturity or some other bonus? 2. After maturity policy will cover life time right? – Means for normal death sum assured will pay again?? 3. What will be minimum and maximum possible amount at my plan maturity for 12lakh sum assured policy? 1. You will receive the SA + Bouns + FAB fully at the time of maturity only. 2. Sum Assured is paid at the time of death even after maturity. In case i want surrender the policy; how much i can get back? Note: I have paid premium for 5 years – 3lakh so far. Get the surrender value quotation from your nearest LIC branch office. Surrendering a policy in between is not a good decision as you loose your valuable insurance coverage taken at the rate provided at a lower age. Further, You will not receive the accrued bonus in full also. My recommendation is not to surrender a policy without sufficient reasons to justify it. I have jivan anand 149 plan of 10 lacs from jun 2011 and i paid premium around 3.20 lac and now i want to surrender this policy. Approx how much surrender value i will get and someone told me that accumulated bonus not given during surrender time. You are right. The accumulated bonus is payable to you only at the time of maturity. If you Surrender your policy in between you will receive only a percentage of the accrued surrender value. And the percentage is called surrender value factor which generally varies between 30 to 100 % depending on the period elapsed. You can get a detailed surrender value quotation from your nearest LIC branch office. My self Yogesh , I have Jeevan Anand 149. plan for 16 years & yearly payments is 70327 & last payment is till july-2025. 1) After paid this how much i will get ? 2) When i will get this ? 3) How can i get .. ? 4) Any other benift ? I assume that the sum assured of your plan is Rs. 10,00,000 based on the premium mentioned by you. So The maturity returns on the 16 th year will include Sum Assured of 10 Lakh and the bonus for 16 years and Final addition bonus. You can use the calculator provided to get the indicative figures. As per the calculator the indicative return is Rs.17,45,000 based on current bonus rates. You will be eligible for a life long insurance coverage equal to sum assured (10,00,000) So the total amount payable from LIC shall be to the tune of 27,45,000 as per current bonus rates. The maturity benefit shall be paid to your account on the maturity date. I have taken 15 policies of Jeeven Anand plan149 on 28/10/2012. Each one sum assured of 1,00,000/-Per policy. Till now i have paid nearly 5.5 years. approx (3,08,7900)/-. Upto my knowledge i gave to pay total of (11,79,738.00) / 21 years for all 15 policies. Im not yet all clear about this plan. can u help whar are the benfits and plus points to me. The maturity amount shall be received on 21 st year. (on 28/1/2033). ’76’ shown in plan and term indicates that insurance coverage is available till 100 years of age. I will get 10 lac as maturity amount on 2033 without any issue right? And life cover and accident cover still be there right? Jeevan Nidhi is a pension plan available from LIC. Read complete details of LIC’ Jeevan Nidhi here. 1. When i will get the maturity money? 2. Why the Maturity Date shows as 28/10/2085? 3. How much will be the Maturity amount? 4. Till which i should be paying the premium? 1) You will get the maturity amount after 20 Years. ie on 28/10/2032. 4) You need to pay premium only up to 20 years. Thank you very much Anish. What is policy term and why it is 73 yrs? Is this a good policy to invest? Hi Neha, I think that’s 100-27(your age) which is 73 yrs..as Anish said you have insurance coverage up to 100 yrs. Hi Anish if anyone not required life cover after premium paying term then what will be the benefit atatimeat of maturity. You can surrender the life long coverage after maturity and get a reduced amount for that. . Check this chart to get an idea of the amount available on surrender of life cover. 1. After paid this how much i will get? 2. When i will get this? 4. How much amount at maturity time? Please use this calculator to get expected maturity value. Amount received on completion of 21 years from date of commencement. Life long insurance coverage equal to 5 lakh available even after maturity. I have taken a LIC Jeevan anand policy (149 78 05) in 2011. I have recieved 2.96 Lakhs on maturity. But I have got a notice from income tax saying I have to pay 88thousand income tax for this. Can you please explain me should I pay tax for this, if so should I pay 30 % tax for the whole amout or just for my profit? In this case I have more than 3Lakhs and got an amout less than that only. On this why should i pay 30% tax. This is worrying me. Can you please help me out with this. Section 10(10D) benefit (Exemption of maturity benefit of Insurance policies from income tax) will not be applicable for the 5-year term, as the premium paid per year will be higher than 20% of Sum Assured in this case. But you will have to pay tax only on the appreciation. ie (Maturity – total Premium) If you are already in the 30% slab you will have to pay 30% of appreciation. If not, you will have to pay tax depending on your tax slab. any more clarifications? You can get more information on tax rules applicable to insurance policies from this article. LiC Jeevan anand plan 149 sum assured amount 100000 ,Yearly premium paid Rs7314 from 2004 on words, Maturity year 2020.
and also what is another benefits. Please use the calculator for maturity value.. give the term as 16 years and Sum Assured as 100000. Life long coverage of 100000 also shall be available. You will have to pay 14 premiums only. so the last premium to be paid is 28/09/2018. HI I am holding Jeevan Anand (Plan-149) policy. But i am not very clear about the returns / benefits of it. i am paying 5163/- per quarter. which started 12/06/2010. i have to pay for total 25 yrs. so what is the benefits i am going to get. Please click on the calculator link to open the Jeevan Anand calculator to calculate maturity returns. Jeevan Anand is a good policy. It provides lifelong coverage. The endowment policy is (Jeevan Anand – Lifelong coverage). When will I get the Maturity amount ? Do I have to wait till 26/12/2079? The maturity shall be available on completion of 25 Years ie 2030. Heartening to see this good work. Thank you so much. The benefits calculator for 149 is so helpful. It really made my day. 2. Is it advisable from the cover perspective to surrender and use the money while still alive. I asked a friend he advised not to surrender. But my understanding is that one can reinvest this judiciously along-with the policy benefits and leave some assets for the nominee which together can prove a good investment with some annual returns. For example an apartment , a shop etc. Yes , it may depend on personal goals and tastes and preferences, but what is preferable from the insurance point of view. Dear Mohammed, All the options are open.. Think well and take a decision. Happy to understand that the calculator was useful to you. When will I get the maturity amount & how much ? The maturity of the plan is after the premium paying term and it will be after the completion of 23 years. Please use this calculator to get likely maturity amount. I have a Jeevan Anand Plan 149 for SA 3,00,000.00 . I have been paying the Premium from 2010 for Rs. 15,341.00. I have paid 9 years. If I surrender the policy now, How much I will get ? Please contact the nearest branch office to get surrender value. Please read the article and get a clear idea of the plan and then decide on surrendering. I have purchased LIC Jeevan Anand 149 in 2010 when I was 27 year old.I have 21 policies each with SA 1 lakh and premium payment term varying from 23 years to 43 years for 1st to 21st policy.So premium pay amount for all policies vary accordingly. Year of maturity for all is 2083.I pay for all policies combined on a quarterly basis.My Query is, is it possible to surrender all 21 policies by 2033 when 1st policy premium term is over and still get the benefits of Accrued Bonus + FAB + SA together . Also what will happen to life cover in that case? Surrendering all your policies will bring in huge loss to you. Further, you will not get the ‘LIfelong coverage’ which is the highlight of this plan. I think Agent’s intention was to provide you a type pension from 23 rd year to 43 rd year. Purchasing policies in this manner have certain advantages as well as disadvantages. The advantage is that you will get a tax free annuity and disadvantage is that you will lose Sum Assured rebate provided for higher sum assured when taken as a single policy. does this plan149 cover a natural or heart attack death even at the age of 80 or so? Jeevan Anand plan covers all types of deaths including natural and accident. So deaths due to diseases also are covered. Please contact nearest branch office to get the surrender value. Please contact the nearest branch office to get the surrender value. I took jeevan anand 149 policy in 2013, I was 27 years old then. Policy term is 73 years. Total 3 lakhs of policy. Paying around 16k every year. So when will I get the maturity amount? What this policy term mean? Does it mean I will get maturity amount after 73 years? Jeevan Anand is a plan having lifelong insurance coverage, which is arbitrarily considered as ‘up to 100 years’ of age. You took the policy when you were 27 and 100-27 gives 73 years. The maturity of the policy is after the premium paying term and in your case, it is after 20 Years. You will be getting a Sum Assured + Bonus + FAB at the time of maturity. Use this calculator to get maturity benefits. kindly let me know how much I might get after 20yrs .. Please use this calculator to get expected maturity returns. My term says 78 and the calculator is not allowing to put more than 30 yes..my understanding was it’s 39yrs,half yearly I pay premium of 5794,sum assured-5L and doc- Mar/2013. Could you please help me understand the terms, till when I should be paying premiums and when can I get the LIC amount when all the bonus? You are eligible for an insurance coverage up to age 100. Actual term of the policy is your premium paying term. Maturity shall be available at the end of the premium paying term. Can I find my premium payment period anywhere on the LIC receipt and as you said 22yrs,so I should be paying the premiums until 2035? There is an error in my reply. I have edited my reply please check it. I presume that you have taken the policy at the age of 22. The term of the policy is available in the policy bond itself. Sorry for multiple questions but I feel it’s only you who can help me here to understand and thanks for your quick responses.Yes,when the LIC commenced I was 22yrs old and just one clarification what I want is, till when I should be paying my premiums?bcoz as per my dad I should be paying it untul I am 60, that’s very long period (39yrs). Dear Sir, I was enrolled in Plan 149 with the commencement date October,2013 with yearly premium for sum assured 5 lack. Premium was discontinued from 2017 on wards ( last paid in October 2016). I am not interested to continue with the policy. My I know whether I may refund any part of the payment maid so far? Jeevan Anand is a good policy and I don’t find any reason to discontinue it. You are getting lifelong insurance coverage in this scheme. Surrendering a policy can bring in a big loss. If you want to know the surrender value please contact the nearest branch office. As the policy is now in paid-up status you can get the paid-up value + accrued bonus at the time of maturity. I have a Jeevan Anand – 149 policy. Bought in 2013 Jan. I have paid premium for 6 yrs totally. I want to surrender this policy now as i do not wish to continue with it. What will be the returns i will get on surrendering it. SA is 700000 & yearly premium is 35895. Table & Prem paying term as mentioned on policy is 149 / 71 / 21. I’m unable to get clarity from the agent who sold me this policy. Please advise. Please contact the nearest LIC branch office to get the surrender value amount. By the way, Jeevan Anand is a good policy and I don’t find any reason to surrender it. Do you have a better insurance-investment option? You will lose valuable insurance coverage at the premium rate as per your age 7 years back. Think well before deciding. If I want amount after Finishing of paying term so how much I will get. You will be receiving Sum Assured + Bonus after the premium paying term. Please refer to the chart given below for the surrender value of lifelong coverage. You cannot surrender any life insurance policy if it has not acquired paid up value. The minimum period required to acquire paid-up value is 3 years. As you have not paid the premium for three years you cannot surrender the policy. Further, if you don’t revive the policy, you will lose the premium paid. So the only option available for you is to revive the policy and make it paid for more than three years. Once revived you can either continue the policy or keep it as paid up till maturity and receive proportional maturity benefit. 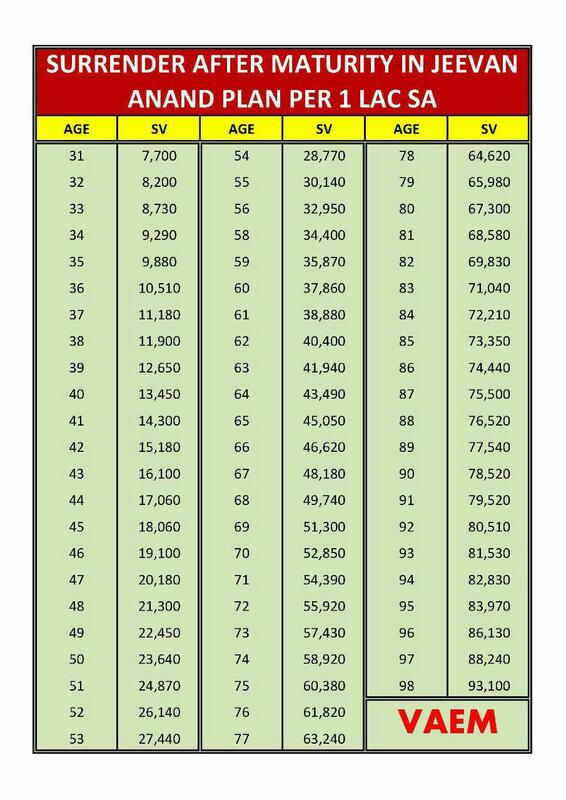 Use this calculator to get likely maturity amount. I took jeevan anand 149 policy in 2009, I was 18 years. Policy term is 82 years. Paying around 20k every year. So i want to surrender the policy and invest the amount in mutual funds (due to personal commitments). Can i surrender now? if yes how much loss will i incur? i read 30% loss from total premiums paid till now, i need some valuable information from you. You can get the surrender value of your policy from the nearest branch office. But I would suggest you to continue the plan and invest some other money in the mutual fund. If you cannot set aside any more money, then keep this policy as paid up and receive the maturity amount after the completion of the term. Do I have to wait till 28/10/2088? I have answered this question several times in the comment section. Maturity is available after premium paying term which is 21 years. Insurance coverage shall be available up to 100 years of age or 28/10/2088. I hold policy jevan anand (149). By using the calculator, i get FAB value as 0. what is the criteria to be eligible for FAB ? As of now, policies with term higher than or equal to 15 years are eligible for Final Addition Bonus. So a 10-year policy is not eligible for FAB. Im having Jeevan Anand 149 policy. 1. I couldn’t able to enter premium term more than 30 year (as my premium term 35 yr) for calculate my expected maturity amount by using your online calulcator. Please solve or do let me know how much will get after my maturity. 2.Can i reduce / change my premium term year? if so what i need to do. 3.Can i change my nominee, if so what is the procedure. 4.income tax applicable for the maturity benfit amount? Thank you for notifying me the error. I have updated the program so that you can enter term up to 35 years. I will be updating it for the term beyond that soon. Please use this calculator. 2. You can reduce the term of the plan if you need. You can approach your branch office to reduce the term. Reduction in term is possible but increase in term is not allowed. 3. You can change the nominee of your policy any time. Approach your branch office. Read more here. 4. The maturity amount is completely exempted from income tax as per section 10 (10D). Read more on income tax rules applicable for LIC policies here. Thanks for your prompt response and updating online calculator. I’m holding two policies with same date and features (Details as mentioned above) but agent are different. While calculating total premium need to be paid with the help of your online calculator, realize that I need to paid total premium of Rs.26215/- surplus than a single policy. Can I merge these two policies with a single one? If so please guide me..
You cannot merge two policies after purchase. You will have to continue the plan as such. The difference in premium is due to the loss of high Sum Assured rebate which may not be available while splitting the policies. I am Srinivas, i am paying yearly amount 42334/- for jeevan anand 149 policy. I need to pay 16years and started in 2008 till now i paid 11 premiums and i need to pay 5 more premiums. The sum assured is 6,00,000/-. Kindly provide me the full details after completion of my premiums like how much and when i will get the full amount. Your inputs are very great to me. Thanks in advance and your supprt. You can use this calculator to get the expected maturity amount of Jeevan Anand Plan. Please supply the details of your policy such as Sum Assured, Term and Age at the time of taking the policy on the calculator. If you still have any doubts, please ask. Thank you for the resourceful website. I am very impressed by you taking the time to respond to individual comments here. I hope you can help with my query too. I have 5 Jeevan Anand (149) policies with premium terms maturing one after the other (i.e.,16-20 years). I took these policies in 2013 when I was studying/working abroad temporarily (i.e., an Indian citizen, temporarily working abroad; NRI). Since then, I became a permanent resident in the foreign country and will soon be becoming a citizen of that country (i.e., will be losing my Indian citizenship). 1. Will I still be able to collect the benefits (SA+Bonus+FAB) after Maturity period, even if I am not an Indian citizen? 2. Will my nominees in India still be able to get the death benefits, if I pass away in the foreign country? 3. Can I still continue to pay my policy premiums even if I am not an Indian citizen? 4. If I won’t get the benefits of this policy because I Iost my citizenship status before policy maturity, can I cancel the policy on these grounds? 5. If I cancel the policy, how much of my premiums will I get back (premiums have been paid up-to-date so far). I appreciate your valuable input on these questions and thank you again for maintaining such an excellent resource for the less informed people like me. Thank you for your nice words of appreciation. (1) You can collect the maturity benefit of your policies without any problem (even if you are not an Indian citizen) as long as you maintain a savings bank account in India. (2) Nominees are eligible for death benefits even if the death occurs in a foreign country. (3) You can continue your policy from your NRI(E), NRI(O) or SB account in India even if you are not an Indian Citizen. (5) No need to cancel the policy in these grounds. Further to add, foreign Nationals of Indian origin (FNOIs) can take an Insurance policy from India any time. Thank you very much for the clear and timely answers, Anish! A few follow-up questions. 1. I beleive NRIs cannot hold a regular SB account in India but only NRE and NRO accounts. If i do not have any of these accounts, are there any restrictions on opening an NRE/NRO account to get the LIC benefit, after renouncing indian citizenship? 2. Assuming I survive the maturity period, can i request LIC to deposit the maturity amount to my nominee (who is Indian citizen with regular SB account) at that time, instead of opening a new NRE/NRO account myself? Just a suggestion: Would you be kind enough to create a separate blog post on this topic – LIC policies after renouncing Indian Citizenship? I believe many people who have immigrated to other countries will benefit from your expertise from such a post and become aware of any specific regulations they need to comply with. NRI’s and Foreign Nationals of Indian Origine can open following types of accounts in India. d) Special Non-resident Rupee Account (SNRR Account). As per FEMA regulation, an NRI should convert his savings account to NRO or NRE account immediately on his status change to NRI. If he has not opened an account in India before renouncing Indian Citizenship, he can very well open an NRO account for carrying out bona fide rupee transactions. Foreign nationals coming to India for employment or as a tourist may open an NRO Account. The account may be opened with funds remitted from outside India or by the sale of foreign exchange brought into India. It may be a savings, current, fixed or recurring deposit account. (2) No Insurance company can pay the maturity amount to the nominee. A nominee can receive only death claim proceedings. Read more here. I shall write an article on this subject as you have suggested. Thank you. Thank you for writing this down so clearly. I was finally able to understand how this policy works. I have 25 149 policies each maturing a year after I turn 50 with SA ranging from 1,00,000 to 2,00,000. Can the death benefits availed for each policy? To clarify – if I pass away after 70, will LIC give 25L (assuming 1L SA per policy) or just 1L? Happy to know that the article has helped you. I assume that your policy was completed as multiple proposals to create a pension plan where each policy get matured every year. While completing such policies a multiple proposal addendum has to be attached to the proposal where details of all the policies taken together have to be mentioned. So your insurance coverage for each proposal will get added up to give you a single coverage. If it has been done like this while completing the policy you will get 25 lakhs + accrued bonus in all the policies as insurance cover. You can check the EDMS image of the proposal submitted at the time of taking the policy at your branch office to confirm this. If you find that it is not in order, Submit an application mentioning the details to the branch manager to regularise the coverage immediately. In 99% of cases, it would have done properly. You will get maturity amount after premium paying term and only life-long coverage continues after that. Sir I have a LiC jeevan anand 149 commencement date 28-10-2008 , premium paying term 43 yrs Policy benefit 300000. Policy term 74 yrs and date of maturity is 28-10-2082. Premium paying 6204/- per year Sir my question is want to reduce my premium paying term to 43 years to 20 yrs ..is it possible to do so and how much difference amount I need to pay and via which methodology can I pay balance amount online as well. You can reduce the premium paying term and for that, you will have to visit the branch office. They will guide you in this regard. My question is is there in FAB or LA added after term. Can i change nominee as when i start i was unmarried . FAB is not available for policies having term less than 15 years and your policy will not be eligible for FAB as on date. LA is not available for Jeevan Anand plan. Read an article about the latest declared bonus rates here. You can change the nominee of your plan any time. Read more here. What is the maturity value of this plan after premium Paying Term is over & what do you mean by life long cover? On maturity you will be getting the sum assured of 5 lakh and accrued bonus after the premium paying term is over. Please use the calculator given in the post for approximate value. After the maturity amount is received, you will have an insurance coverage equal to 1 lakh throughout your life. This is the life long cover. After receiving the maturity amount, LIC will return the policy document to you and there for you will not have any problem in receiving the life long cover later. HELLO SIR , I started paying for jeevan anand 149 when i was 18 . now i am 32.
i was told by the broker that it is a 15 year term but he cunningly made the term 21 years. my question is how much would by final rate of return be at the completion of 21 years. premium amount 120823/- every year. can i cut short the premium paying term to 15 years? also can i change my agent , as he no longer provides any service. What I have to tell you is that you are not a loser by keeping the term to 21 Years. Please check this article to know more. I think this article will clear most of your queries. After reading this article if you have any more doubts, please let me know. You can reduce the term of the plan but that is not a good decision. Changing an agent is possible if your policy is remaining in lapsed position for some time and a new agent is helping to revive it. In all other conditions, it is not possible. FAB rates changes depending on the Sum Assured and Term of the policy. Please refer to this post on the latest Bonus Rates. Sir-I have LIC Jeevan Anand Plan 149 for SA of Rs2 lacs for 21 yrs. Starting from April 2004. As per the calculator, I can expect total maturity benefit of 415800 and lifelong cover (upto age 100) of Rs2lacs and additional accident coverage (upto age 70) of Rs4lacs. I want to stop paying future premiums. If I make the policy paid up, what would be my revised maturity benefit, lifelong cover and addtl. accident cover? Is there anything else I will lose? Will I benefit by completing the premium payment term or by making the policy paid up as I look to invest the saved premiums into MFs through SIPs. Kindly let me know. If you stop paying the premium after three years the policy will become paid up. Paid up value of the policy will be Sum Assured * Premium paid /total premium to be paid. So the paid-up value will be 200000*15/21=142000. Maturity benefit for this paid up value will be 1.42 lakh + (bonus for 1.42 lakh) = 1.46 lakh total 2.88 lakh. You will lose life long cover and additional accident cover. My opinion is to pay the remaining premium and avail life long coverage. 1. Why my premium is 59123 instead of 41,000 as per the details mentioned by you above. It is not matching – I am confused I am paying such large premium for same policy details you mentioned. 2. What is the amount I would be receiving by end of 2025 and also, is it tax free? 3. What does maturity date of 2085 means ? The premium of every policy changes based on (a)age at entry (b) term of the plan and (c) Sum Assured. Please give all these details and then only I can comment on the premium. 2. Maturity amount can be calculated using this calculator. The maturity amount is completely tax-free based on section 10(10d) of income tax act. 3. The maturity of 2085 means life long insurance coverage is available up to 100 years of your age. When I calculated for 16 years it comes around 559904. 2. Do I get money after 16th year. If so how much ? 4. What does maturity date 28/06/2087 means? Can you please reply to my queries. It will help me a lot in understanding the policy. 1. Please note that a 5 lakh sum assured policy does not mean that you will have to pay a total premium of Rs.5,00,000. What it implies is that Insurance coverage of your policy is Rs. 5,00,000. The premium can be less than or more than 500000 based on the age of the person taking the policy and additional benefits provided in the policy. In Jeevan Anand policy Life long additional coverage equal to Sum assured is there. So for that, you are paying some additional premium also. 2. You can use this calculator to get the expected maturity returns available on the 16th year. 3 The policy term of 74 years means you will get additional life long insurance coverage up to this period(100 years of age). 4. The final maturity date of 2087 is the year when you will attain 100 years of age. I have jeevan Anand for 300000. My policy commencement year is 22 years and premium paying term is 12 years. My maturity date is mentioned as 14/10/2091. When will I get the maturity amount? After 12 years or 2091? 1.How much I can expect if I surrender this policy now? Already invested 177233 in 7 yrs. 2 What option do I have as I am convinced investing in this plan will not yield much and even paid up option will block my fund for another 14 years. You can obtain the surrender value from the nearest branch office. Only option available to withdraw from the plan is by surrender or keeping it as paid-up. Kindly advice that when i can get the maturity amount and how mach will i get. I have paid all the premium for up to date. You can receive the maturity amount after completion of 11 years from the date of commencement. Life long coverage continues even after that. You can use this Jeevan Anand calculator to get the approximate maturity amount. my father had taken jeevan anand policy in 2011 of SA 300000 with term 18 years. now my father expired in 2018. company has paid only 408000 as death claim which SA + accumulated bonus. i want to know is the company has made right settlement. company did not pay FAB, why??? Please check the final addition bonus rate chart. Final addition bonus rate is not available for periods below 15 years. So only Sum assured and accrued Bonus will become payable. I purchased lic 149 plan on 2013 September sum assured 10L , how paid up can I get now. Paid up value = 1000000*5/Term of the policy. I presume that you have paid 5 years premium.